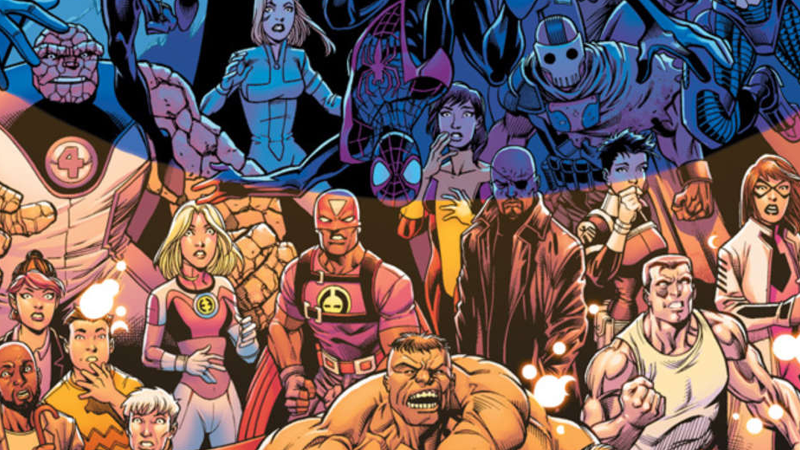 So What Actually Survived the Destruction of the Ultimate Marvel Universe? Image: Marvel Comics. Ultimate End art by Mark Bagley, Drew Hennessy, and Nolan Woodard. It’s been almost two years since Marvel bid farewell to the Ultimate comics universe it began in 2000—smashing it right into its “main” universe to kick off Secret Wars with a multiversal bang. But in the past new years of the “All-New, All-Different” universe, a few elements of Ultimate Marvel have lived on. Let’s start with the big one—perhaps the most important character to have survived the Ultimate and 616-universes going kablammo. Miles has been swinging around as Spider-Man from the get-go of the all-new Marvel universe, having sneakily hidden himself aboard a life raft that protected several heroes from the destruction of reality and its reformation into the Battleworld during the events of Secret Wars. The reason Miles survived beyond that? Well, aside from his popularity as a character, the real reason was the fact that he just so happened to give Molecule Man—who Doctor Doom had been using to power the creation of Battleworld, as well as his rule over it—a three-week old burger he happened to have on his person during the collision of both realities. Gross, Miles. Also, where the hell do you keep hamburgers on a body-tight spidey suit? Molecule Man remembered Miles’ act of kindness, so as a favor when the new “Prime” reality was created at the climax of Secret Wars, Molecule Man ensured Miles—as well as his family and most of his friends from the Ultimate universe (sorry, Ultimate Jessica Drew)—survived and had a place in the new reality... even if there was already was a Miles Morales in this existence, who will play a part in an upcoming Peter Parker/Miles Morales team up series called Spider-Men II. The Reed Richards of the Ultimate Universe had a similar life to the one on our own... until he didn’t, and went insane. Following the catastrophic events of the infamous comic series Ultimatum (which saw tons of Ultimate heroes killed off in some spectacularly terrible ways) and his split from Sue Storm, Reed devolved into bitter madness, refashioning himself from Mr. Fantastic into the Maker, someone more than willing to sacrifice his morals to save the world, often bringing him into conflict with his former allies. The Maker and his allies in the Cabal—who had been searching for a way to survive the impending “Incursion” event that saw the Ultimate and main Marvel Universes destroy each other in Secret Wars’ opening—actually made their way over to the Battleworld, However, after attempting to betray “our” Reed Richards at the very last moment in order to rebuild a new universe in his image, the Maker was torn apart by Molecule Man, and eaten alive like several, very gruesome Reed Richards pizzas. Thanks to the power of comics, the Maker got better, of course, and survived into the new Prime Marvel universe. He’s lately been working from the shadows to try and bring about the destruction of the new reality pretty much since Marvel relaunched itself with “All-New, All-Different.” He hasn’t managed to do so... yet. Ultimate Thor’s Mjolnir was a little more heavy metal than the Mjolnir we all know—well, the second version of it was at least, as it was a sort of axe-hammer hybrid. After losing it in the waning days of the Secret Wars while he perished besieging Doctor Doom’s fortress, Ultimate Thor’s hammer found its way to the old Asgard of the newly-born Prime universe, and lay there until eventually the Odinson of the Prime reality (a.k.a. “our” former Thor) struck out to claim it for himself during the Unworthy Thor miniseries, having lost his ability to wield his own Mjolnir. Although he found the hammer, Odinson declined to take it for himself, having come to the realization that he no longer sought the false-worth of his fellow Asgardian gods. But someone else did, with a mysterious figure claiming to be a “War Thor” took the hammer for their own in the climax of Unworthy Thor. We don’t know their identity yet, but they’re due for a team-up with both Odinson and the current wielder of the maim Mjolnir, Jane Foster, in the pages of Mighty Thor. After Ultimate Wolverine perished in the aforementioned Ultimatum event (seriously, so many deaths!) his legacy was passed on to his unwitting son, Jimmy Hudson, who grew up never knowing that his real parents were Wolverine and Magda Lensherr (who, in the Ultimate Universe, also got together with Magneto and gave birth to Scarlet Witch and Quicksilver. COMIC BOOKS!). After his real father died, Jimmy quickly discovered he’d inherited his mutant powers after he survived a car crash that should’ve killed the teenager—and woke up with Kitty Pryde at his door with Wolverine’s personal effects and a message to Jimmy. The young man’s powers soon fully flourished, and he took on the mantle his father left as the new Ultimate Wolverine. It’s not been fully explained yet, but somehow Jimmy survived the destruction of the Ultimate Universe and has since shown up in the pages of X-Men: Blue, the current X-book focusing on the adventures of a young, time-displaced version of the classic X-team. Marvel has since confirmed that Jimmy will be joining the series as a regular member of the team, but whether he takes on the Wolverine mantle—which would be pretty rude, considering Laura Kinney already has it in the wake of Prime Wolverine’s death a few years ago—remains to be seen. All of these individual Ultimate elements somehow surviving into the new Marvel universe might be part of something bigger. Because at some point, the whole Ultimate Marvel Universe might actually come back. We don’t know how yet, though. The first issue of the relaunched Ultimates series late last year concluded with a splash page teasing what was in store for future issues in the comic, and tucked into the bottom right corner of the page was the Maker himself looking over what he claimed to be the Ultimate Universe. We know he’s been working for a way to restore his reality since the birth of the Prime Universe, but could the Maker one day find it? Somewhere out there in the new multiverse our version of the Fantastic Four and Molecule Man has made it their duty to create, the Ultimate Universe could still exist. We’ll have to wait and see.